It’s been a crazy, hectic week here. Our 9-year-old E. is in an opera! She and several of the students from her school are part of the children’s chorus in a local opera production, which will (finally) be performed this weekend. Between driving her to and from rehearsals and staying up late to make sure she gets her homework done, D. and I are almost as tired as she is. So our meals have become simpler as our lives have become more chaotic. One of my favorite fast-but-healthy meals is fresh peas, a steamed vegetable, and a starch. If you can get fresh peas of any kind, the taste is just miles better than the canned version. Here in Mississippi, farmers’ markets and farm stands often sell already shelled peas in several varieties–lady cream peas, pinkeye purple hull peas, and baby lima beans are among my favorites. Whatever the variety, my technique for cooking them is pretty much the same. First, I chop an onion and sauté it in a non-stick saucepan until it starts to caramelize. Then I add a little garlic, and cook for another minute. Then I add the peas (about a pound for the 3 of us) and enough water to cover them by about an inch. I season them well with whatever herbs I’ve decided to use. This time around, I cooked the adorable pinkeye purple-hull peas with thyme, rosemary, and fresh French tarragon, but for lima beans my favorite combination is thyme and marjoram. Sage, parsley, pepper, basil, oregano–all of these herbs have made their way into my peas at one time or another, and they’re all good. While the peas are cooking, I prepare my side dishes. Steamed broccoli is a favorite around here, so it’s my fall-back vegetable. As far as starches go, we’re usually potato people. Mashed or baked potatoes both go well with peas, though sometimes I will opt for hash browns. On this occasion, however, I took a little extra time and threw together some corn cakes. Corn cakes are great when you’re in a hurry; they cook much more quickly than a pan of corn bread, though if you’re feeding a crowd, a pan of corn bread will save more time. 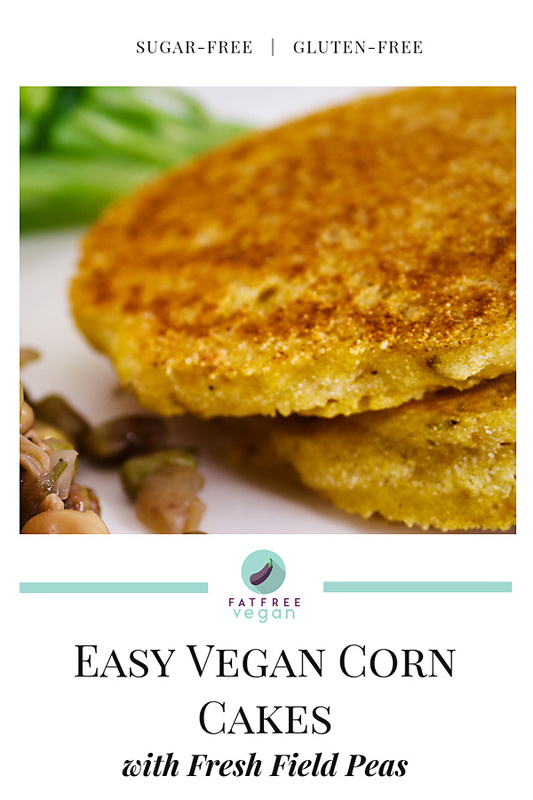 I make corn cakes a little differently each time, but here’s the version I made most recently, which should be gluten-free if you use brands of corn meal and flour that are certified gluten-free. If you're not cooking for a crowd, corn cakes can be made more quickly than a pan of cornbread. This version uses gluten-free flour in addition to the cornmeal. Mix the corn meal with the hot water until crumbly. Add the remaining dry ingredients, and stir to combine. Mix the soymilk with the lemon juice and pour it into the dry ingredients. Mix well, and set aside while you heat your skillet. If necessary, spray a non-stick or cast iron skillet with a little canola oil (if your skillet is truly non-stick, you may be able to skip this step). Get it hot, and then cook the corn cakes like pancakes, allowing about 1/4 cup batter per corn cake. Cook until well-browned on each side. Makes about 8-10. Hi there, This recipe looks absolutely delicious! I’m gonna try it right away! Thanks for providing this awesome recipe. I am printing this off right now! I found your blog on Google and read a few of your other posts. I just added you to my Google News Reader. Keep up the good work! Look forward to reading more from you in the future. These were great with my sauteed cabbage and bbq tofu today! They turned out well even though I used corn flour instead of rice flour, ACV instead of lemon juice, a little extra baking powder and oil instead of the egg replacer and water in place of soymilk. I knew I was making a lot of exchanges but your recipes have been so reliable, I was pretty confident that the outcome would be good…and it was! Thanks for posting another great recipe! just wondering if i could use wholemeal flour in place of the besan or rice flour? wow – corn cakes with spinach, garlic, and black pepper! This recipe is amazing!! I adjusted it a bit – using half a can of coconut milk instead of soy and a (small) banana instead of egg replacer. I also added chopped scallions to the mix for some added flavor, since I also left out the red pepper. Finally, I mixed two tasty things – the remaining coconut milk and some maple syrup – into something worlds better than either. I can’t wait to try this for breakfast with peaches or strawberries! Thank you! I made these tonight to serve with lentil soup. I used white cornmeal and whole wheat flour. The kids, who aren’t as happy about going more vegan, ate them happily. We’ll make this again! Thanks. Lovely! I served them with spinach and the combo was really good. Pure comfort food! Plus they are easy to make and pretty healthy. I am delighted to have discovered your site. I love just about all the recipes so far.this is my kind of cooking! 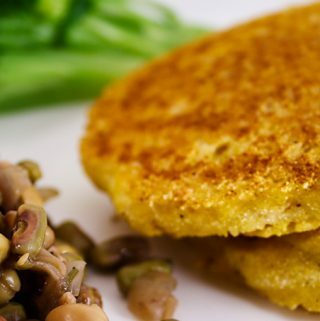 I will be making these corn cakes again to go with our black eyed peas on New Years day (I’ll be using your cashew kale recipe also for the greens)…We’re not superstitious either but what a great time to stock up on beans & greens while the stores have them on sale-Thanks for your wonderful blog & wishing you a happy 2012! They seemed runny to me even after adding an extra cup of cornmeal. Not sure but next time I will use half the pseudo-milk. I never would have thought of adding blueberries! Sounds like a great GF treat! They may be heavier and more gummy, but it will probably work. 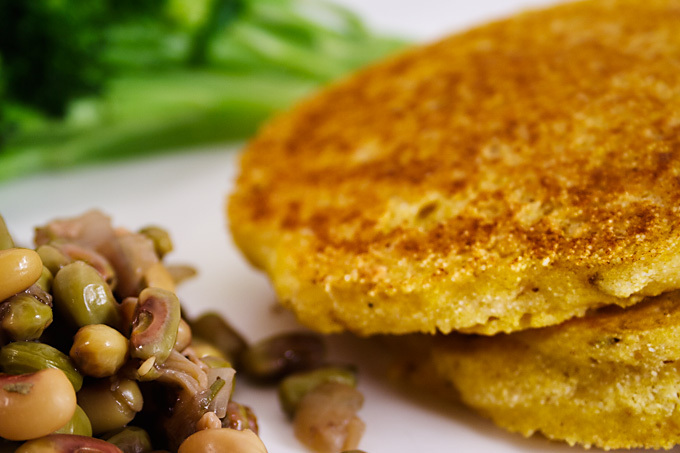 I just made these corn cakes and added black beans, chipotle spices, and onion… they were awesome. I wish I had some salsa to top them with. Would these bake up nicely? No, I was thinking more like as is and bake instead of fry. Would it crust on the outsides by baking vs frying? I have tried the cornbread and it was delicious, but it’s too much for just me unfortunately. I don’t think so. Imagine trying to bake pancakes. That’s what this batter is like, just a little thicker. I suppose you could get your frying pan really hot in the oven and then pour in the batter and bake, but that seems to me to be as much trouble as frying them would be. Okay, thanks. I can understand now. Thanks for explaining. I’m having to follow the FodMap Diet for IBS and I’m trying to find an alternative for pita bread that I normally eat with my soup. As always, thanks so much for all the wonderful recipes and camera shots. You’re so appreciated! Firstly thanks you’re site has been AMAZING. I made 6 recipes today. Do you think you could steam these like you did the moin-moin? Thanks again from down under. I’m happy that you’ve had success with the recipes. To answer your question, I don’t think these would be as good steamed, though I guess technically it’s possible. stupid question, for the egg replacer, should I just use the powder dry or mix it with water 1st? Just add it dry with the other dry ingredients. Made these this morning and used chia seeds in place of the egg replacer. Worked great! Thanks for the awesome breakfast, Susan! I had to make these again this morning. Couldn’t get them out of my mind. I used half course and half fine corn meal, added cumin/onion powder/garlic powder/smoked paprika, then threw in some minced green bell pepper, jalapeno, and a few handfuls of frozen corn. Oh my goodness, were they fantastic! 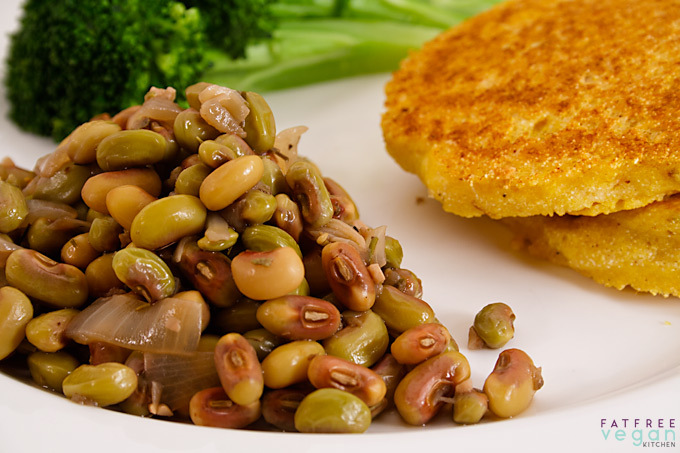 These corn cakes look great – do you think they would go well with your black and red lentil chili? I made these, following the recipe, except I used Brown Rice flour instead of Chickpea flour. And I added a pinch of dried Cilantro and made a flax-egg replacer instead of Ener-G. They came out great. They have great flavor and texture. These will definitely be a regular part of my cooking.